Your kitchen looks plain and boring? Fortunately, a plethora of easy ways helps add color and turn the hardest-working space in your home from drab to fab. If you are planning a major renovation, anything from repainting cabinetry and walls to changing countertops, the backsplash, and hardware to buying new colorful appliances and lighting fixtures can do the job, it all depends on your budget. However, some truly simple, no-paint options can help brighten the kitchen without breaking your budget. Adding new window treatment or an area rug, revamping kitchen chairs and bar stools, and displaying beautiful, colorful tableware are solutions worth considering. Note that even adding a single piece of art, vintage posters, or groupings of family photos can dramatically change the look of your kitchen. In addition, always remember that adding greenery is the simplest, easiest, and most affordable way to enliven any space. Flowers/cut or potted/, especially when arranged in beautiful vases or planted in colorful containers/ are an option to immediately add color, charm, and personality to your kitchen. 1. Give Your Kitchen a Coat of Paint! As cabinets take the most of the kitchen, unquestionably, colorful cabinetry is the most impressive way to add color. If buying new cabinetry is not an option/because of budget or any other reasons/, choose a color that makes you happy and paint the existing ones. Think of this solution as of a possibility to add personal touches to the space. If you have glass-front or open cabinets, paint their backs to make a background for displaying kitchenware. Painting floating shelves is also an option. Get creative, you don’t need to paint all your cabinets, choose the lower or the upper ones, or just a single one to add more visual interest and personality. Another stunning option is to use different shades of one color for the upper and lower cabinetry. You can even go a step further and mix and match cabinets. Is this idea too bold for you? 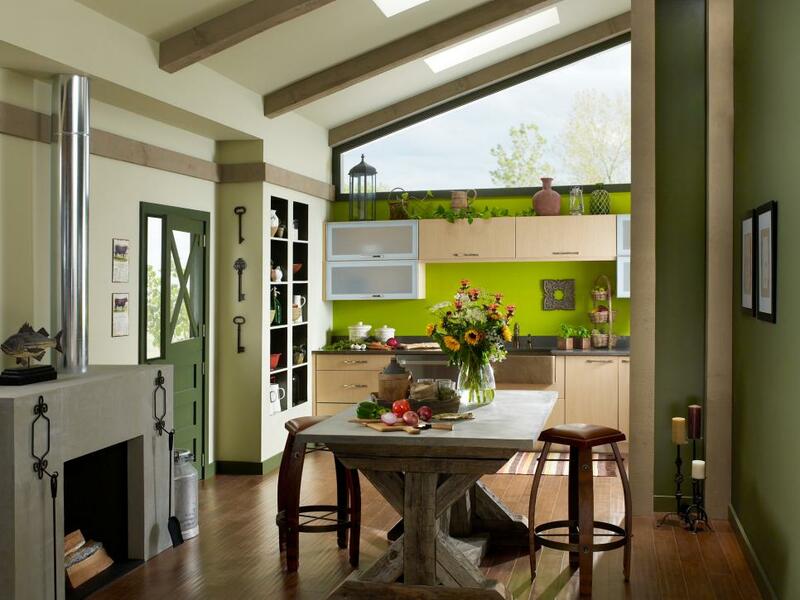 In addition, you can opt for matching or complementing colors for the walls and cabinetry. 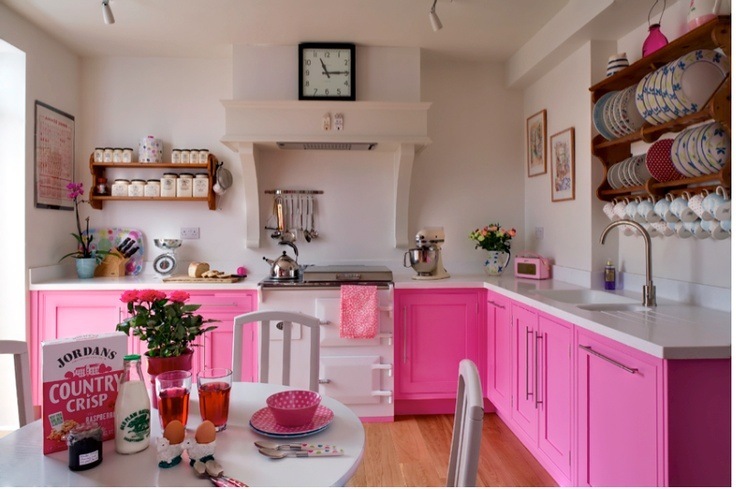 In the picture above, a lovely kitchen with pink lower units. Open upper units serve to both store and display adorable kitchenware. Natural wood flooring adds warmth. Definitely a charming kitchen with personality and a distinctive feminine look. When it comes to painting, walls are the first thing that comes to mind, this is the most obvious way to add color. You can repaint the entire space or create a bold accent wall. Above, a truly impressive eat-in kitchen. An intense green accent wall complemented by a green-painted door and backsplash add so much character to this kitchen with an organic vibe. Painting the kitchen and pantry doors is another option to consider. Don’t forget about the kitchen island, floor, and ceiling. Imagine the unique look of your kitchen with painted spaces within a coffered ceiling. If for any reason it is difficult to choose a color, opt for natural wood, it can create a sense of warmth and coziness, add an organic vibe, and lend your kitchen a timeless look. 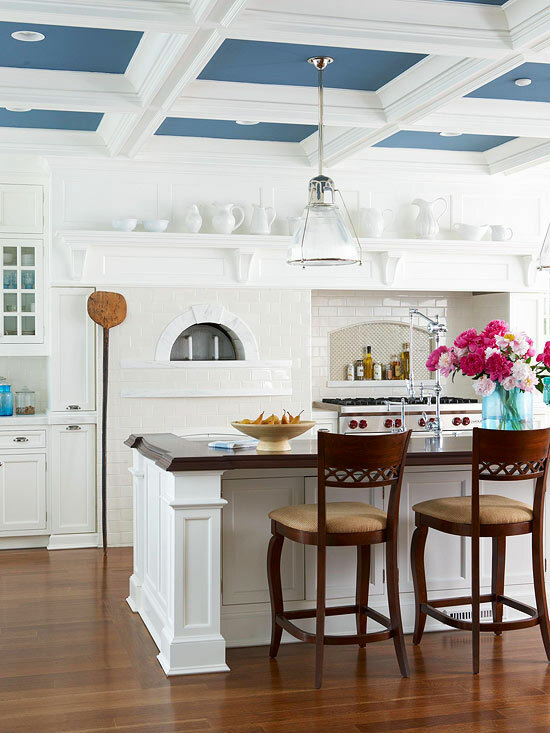 In the above-shown picture, a dose of blue is added by painting the spaces within the coffered ceiling of this almost all-white kitchen. Definitely a creative way to add color, charm, and personality! The options are endless, the choice is yours. Just remember, a coat of paint can definitely work miracles. To begin with, if planning to change any of your kitchen appliances, large or small, why not take the chance to enliven your kitchen? Whether a stove, refrigerator, dishwasher, mixer, or toaster, available in a range of colors, colorful appliances can completely transform any kitchen. 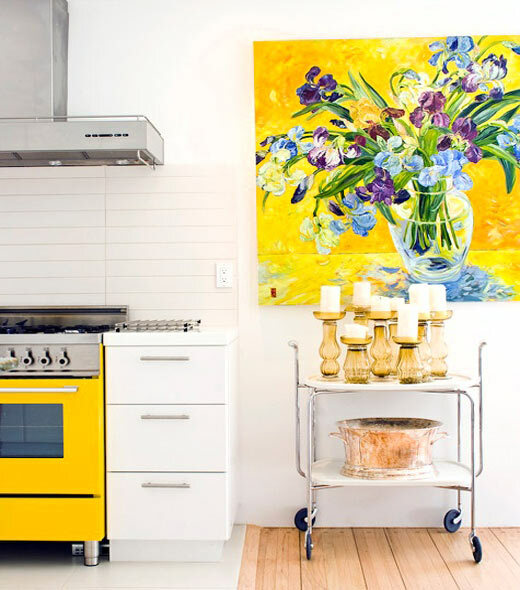 Above, a lovely yellow stove coordinated with an attention-grabbing piece of wall art adds tons of color, charm, freshness, and personality. A bar cart serving as a display space adds extra doses of visual interest. What a fascinating kitchen! Changing countertops, the backsplash, or lighting as a solution that helps add color is also worth considering. In the above-shown kitchen, a statement multi-colored island countertop complemented by the backsplash and pendants lends the space an intriguing, unique look. Note that lighting is of crucial importance for any space, in terms of both functionality and aesthetics. Above, dropped at different height for extra visual interest, these three globe pendants in different colors make a focal point in this unique neutral kitchen. Throw pillows and fresh flowers also add splashes of color. Definitely a mind-blowing space! Some options are definitely simple and affordable, such as adding a new easy-to-clean area rug or barstools or changing the table cloth. Buying new colorful kitchenware is also an easy fix. If you have open upper cabinetry or shelving, use it to display colorful dishware and collectibles, this is definitely a super easy, creative, and inexpensive way to add color and personality to your kitchen. You can also try to make a dishware wall collage. 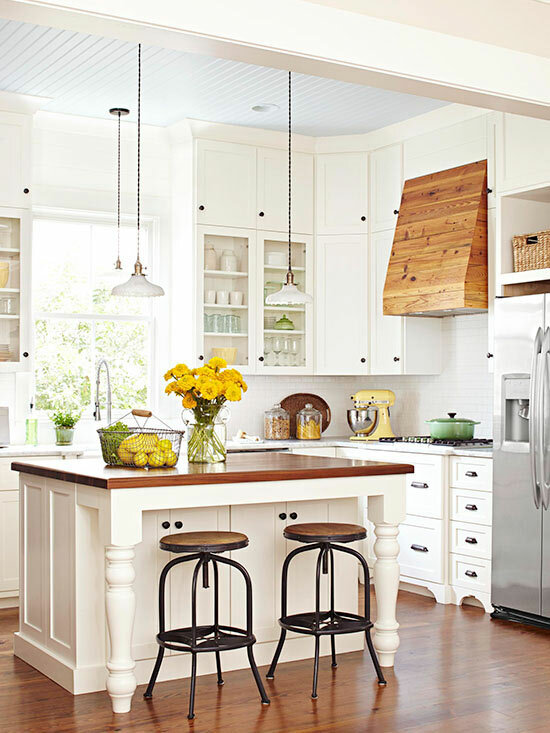 In the picture above, a lovely kitchen with pops of color. 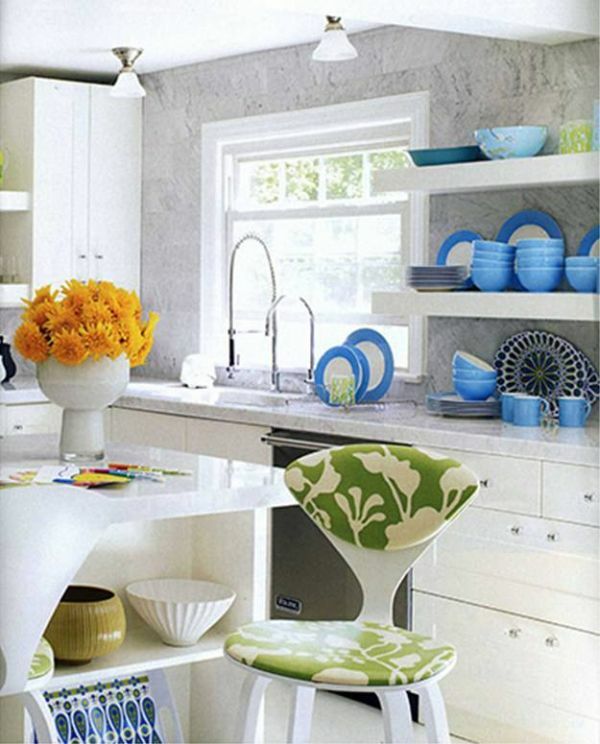 Beautifully displayed dishware adds color and personality to this kitchen. Chair upholstery and cut flowers bring in an extra dose of color and freshness. Although fabrics are not used that extensively in kitchens, always consider them as an option to add both color and pattern. If you have a banquette or a window seat, add colorful throw pillows to create a sense of comfort and coziness. Dining chair upholstery, bar stools covers, and window treatment are other options to introduce color, pattern, and texture with fabrics. When it comes to adding color, pattern, and texture, wallpaper is another choice. Think creatively and go beyond its use as wall covering. For example, it can be applied/instead of paint/on the backs of open cabinetry for adding both color and visual interest. An unexpected, inexpensive way to incorporate both wallpaper and fabrics is to make panels, which can be used as wall art. This easy-to-change custom made to fit any size and shape solution is definitely worth trying. Speaking of art, it offers another no-paint option. Whether artwork/one large piece or some smaller ones/, word art, wall decals, posters, collections of framed vintage kitchen items, or family photos, the choice is yours. 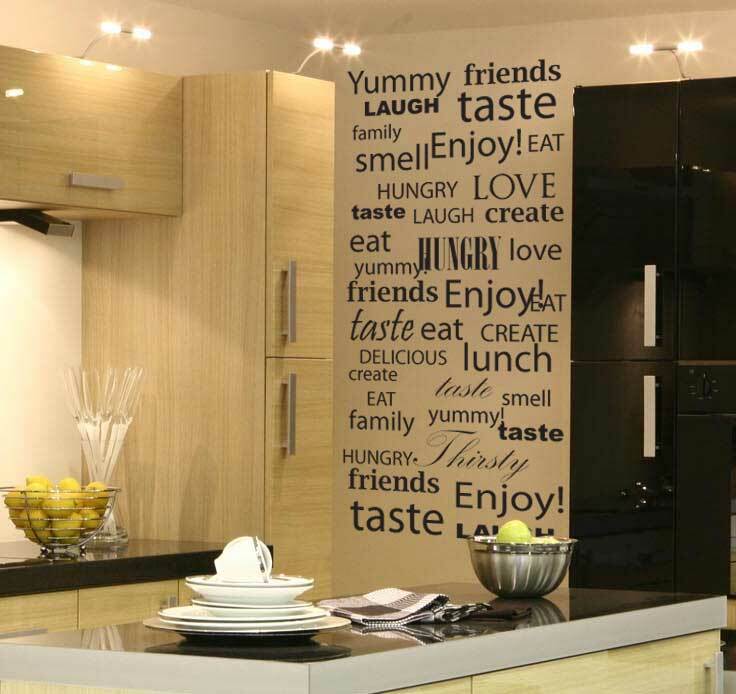 Note that wall decals are a removable, reusable, and inexpensive option. In the picture above, a piece of wall art takes this contemporary kitchen to the next level. Actually, the simplest and the most organic way to add color to any kitchen is to include potted greenery and flower, fruit, and vegetable arrangements. Just imagine your kitchen with some pots of herbs! Charming, isn’t it? In the picture above, cut flowers, a basket of fruits and vegetables, and a pot of herbs add color and freshness to this kitchen with all-white cabinets. The extensive use of wood creates a sense of warmth and coziness. A yellow mixer is definitely a statement item. Truly fascinating! 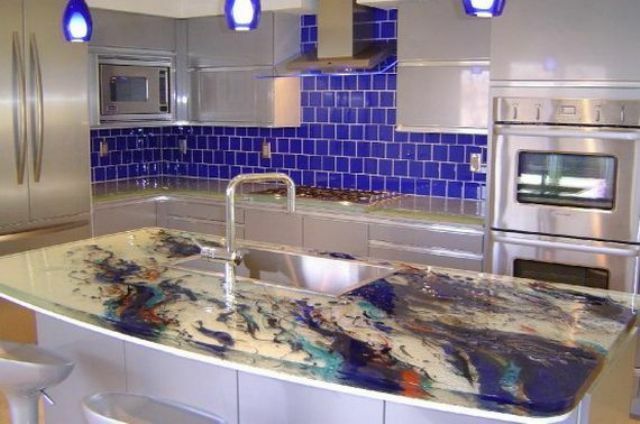 Unleash your creativity and you can come up with unexpected, unique ways to add color and lend your kitchen a chic, bold look. Kitchens are the heart of our homes, a place where family/and sometimes friends/ gathers to have breakfast, just talk, or entertain. As everyone spends a lot of time in the kitchen, it should go beyond the limits of pure functionality. If you are bored with its look and think your kitchen is not that inviting and charming as it should be, try to add some color. Think outside the box, there is no limit to creativity. With so many color makeover options it is not that difficult to transform your center of daily activities even with easy-to-do, budget-friendly DIY projects.